The Pegaus-1 Mission launch schedule 01/28/2015 from Othello, WA at 11AM PST and was delayed several hours. We eventually got airborne mid-afternoon. Several technical problems occurred, e.g. the Ham radio was not operational. This was the backup location system in case we lost the primary GPS, and now we were flying with only a single system to locate the craft. The tracking devices were a directional ground station and an omnidirectional mobile station that we used in the chase vehicle. The ground station had long theoretical range to maintain contact, while the mobile station was much shorter in range. Early in the flight the ground station, experienced some issues and lost contact with Pegasus-1. The shorter range mobile unit was all we had to maintain contact with Pegasus’s location. We had spent many hours trying to make sure we would have contact with Pegasus-1; otherwise we would lose her in a lonely field in a lonely place. Now we were hanging by a thread with only the primary GPS and the mobile unit. As Pegasus ascended and turned due East, the ground station came back online and we had 2 points of contact with the craft. Some relief, but still living only on primary GPS. The telemetry stream was amazing as we could see the information streaming in every 2 seconds from Pegasus-1. The altitude on the GPS was not updating as fast as we expected, which also led to suspicions on the accuracy of the primary GPS. Was Pegasus-1 where we thought it was? The low hanging cloud layer gave us no visual on the craft, we just had to go with what we had. The ground units pushed the telemetry into Piraeus, our Operational Technology, where a Web site could instantly display not only the telemetry, but also the location of Pegasus-1 on Bing Map. Our chase team used the Bing Map updates to keep positioning and maintaining contact. This was very entertaining. We were expected a turn to the West in the upper atmosphere, almost reversing the course that we had traveled. This occurred as expected with a slight WNW heading from the lower altitude E heading. We had purposely not expected to take Pegasus-1 to burst altitude, instead we intended to control the descent with a remote release of the delivery system. As we moved further to the West and slightly North the craft was tracking further from the main road, US HWY 26. 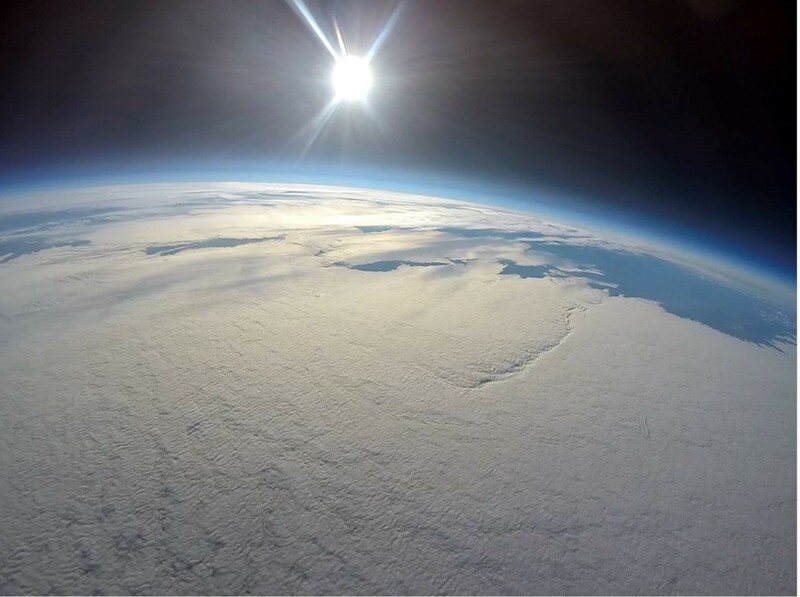 Given that the altitude had reached mission objectives and that ruggedness of the side roads, we decided to release the balloon and begin the descent stage. Our descent was to be a HALO drop to about 1,000 meters above the surface of the earth where the main parachute would be deployed. Our tiny 12″ drogue chute would keep Pegasus-1 in a vertical position to maintain contact during the rapid descent, expected to take 10-13 minutes from the apex of the flight. We released the delivery system and began the descent stage dropping at 212mph from about 85,000 feet. Only a few seconds later, at 75,000 feet, we lost primary GPS, but kept streaming the other telemetry data. The chase vehicle was positioned on a gravel road approximately 1.5 miles to the SE of Pegasus-1 when we lost GPS. Our strategy was to move either North of South to intercept, but without GPS and the low hanging cloud layer, we had to get a visual. Time had passed and we continued to look for the craft in the agricultural fields East of Othello, WA. It was going to get dark and we needed to back to launch site and pack up for the drive back to Seattle. We had lost Pegasus-1, but had proved the technology Piraeus, command and control, much of the craft design, and we did have the telemetry…but we didn’t have the video from the onboard GoPro camera or our craft. Now packed up and getting dark, we began the 3+ hour drive back to Seattle, disappointed without the recovery of the Pegasus-1. Several days later I was reviewing the telemetry and noticed an abnormality. It appeared the primary GPS had come back online with only 30 seconds of flight time left. The chase team was scanning the horizon for signs of the craft when this occurred. We would not have noticed, nor expected it. Could Pegasus-1 have called for help at the last stages of flight? I considered this a remote possibility and began to check path, air pressure, and other telemetry to determine whether this “burp” of location information could possibly be valid. The location “burp” was in a direct line from where the GPS cut out at 75,000 feet and in the expected path. Careful analysis lead us to believe that Pegasus-1 was about 1.5 miles due North of where we had stopped the chase vehicle. The probability cone as only about 600 feet from the last location. Had we found where the craft actually rests? Our excitement was high and Mark Nichols, my partner in this adventure, had decided to stay an extra day in Seattle and make the 250 mile drive back to the site and try to recover Pegasus-1. He called me and said he was standing on the spot, but no sign of the craft. He wandered through the fields for a time, then decided to drive a short distance to a nearby business to see if anyone had seen a UFO in the field. The business informed him that they knew nothing and he began his disappointing drive back to Seattle. Mark pulled out of the business toward the same point that he had started and noticed some orange out the left side of the automobile. He stopped. He saw some green, it looked like trash in a field. If the drogue parachute was orange and white, what could be green. The shroud lines of the main parachute!!! Mark approached and there it was. Pegasus-1 fully intact and only 800 feet from where we thought it to be. The Operational Technology, Piraeus, not only was critical to real-time flight operations and distributing to others to view, it also saved Pegasus-1’s dying breaths of GPS location. We now have the telemetry and incredible video of the flight. We are compiling and condensing the video about this amazing story to release soon. While Mark and I may have been the tip of the spear for the Pegasus Mission, nothing happens with the help and support of others. Our launch and chase team (Rohit Puri, and Gupreet Singh) and the unwavering help and support of Microsoft Research’s Orleans team that guided us for over a year in the construction of Piraeus, the Operational Technology that puts the real-time IOT into the Pegasus Mission. It takes a village, a village of dreamers and innovators. So glad you found Pegasus and had a successful flight. I attended your lecture at TechReady 20 and was checking in through out launch day. Truly a wonderful demonstration of how to apply current technology in a functional architecture. Congratulations! Looking forward to the video and learning more about Piraeus. Amazing! Looking forward to more information and video. Awesome, great story! I’m looking forward to seeing the video.